Sarah Merritt was at Silverstone last weekend and sat down with Manor Sporting Director, Graeme Lowdon, to see how things have progressed since we last chatted in January this year. Sarah Merritt: When we spoke last, at the Autosports show in January, I asked you if you could reveal what was next on the agenda for you, and at that point you weren’t able to – but alluded to having some exciting options on the table. So here we are, 3 months later, and you’ve been busy! Since your announcement in early February that Manor were to compete with a car in the World Endurance Championship, and fulfil the dream of competing at Le Mans, you’ve then announced that you will be entering a second car too. Tell us, how does it feel to be embarking on this new challenge, alongside John? Graeme Lowdon: It’s been an awful lot of hard work. We always said that we’d treat every championship we go into with the maximum respect, otherwise there’s no point. We couldn’t action too much until we knew we had the entry, so John and I went to Paris when the grids for the FIA World Endurance Championship & Le Mans were announced, and we saw it on the screens; Manor for WEC and 24 Hours of Le Mans, and thought, great – now we can really start! GL: And that’s what makes doing this worth doing – to me, that’s the measure of how you go about things. We couldn’t have done this without people wanting to be involved, you can’t force anyone to go racing, so it really was a brilliant feeling that a lot of people have the same passion to go racing with Manor. This is the 27th season for Manor in competitive motorsport, and it’s a completely new challenge, and a massive one as well. The World Championship itself is a pretty big challenge, Manor have never raced a car with a roof before, so there’s a first there, and there’s a huge amount to learn with the greatest race in the world at the centre of it, the 24 Hours of Le Mans. It’s a very different challenge to Formula 1, but a challenge that is very attractive, and we are delighted to be here now. SM: Looking at your driver line up, we see the obvious familiar faces in Roberto and Will, as well as your other drivers, some of whom I believe have driven for Manor in the past? GL: Yes, and probably the most obvious face would be Tor Graves. Tor has probably driven for Manor more times that anybody else! He drove in Formula Renault for Manor, he was in our team on a lot of occasions when we’ve made big steps into different formulae. Tor drove for Manor in 1999, when Manor went into Formula 3, as Marc Hynes teammate, and Marc is involved in this project as well. We’ve always stayed in touch, and separately, Tor has done quite a lot of WEC, so it was a brilliant opportunity for him to come back. James Jakes has driven for Manor a couple of times before in Formula 3 and GP3, so we’ve had a really successful time with James – plus he’s a Yorkshireman and proud of it, so he fits into Manor! Of our driver line-up, there’s only a couple of guys that haven’t driven for Manor before – and again that’s nice. Richard Bradley, who won LMP2 class at Le Mans last year, so that’s a good part of the mix to have somebody with that experience. We’ve got guys who have been at the sharp end of all sorts of different formula’s and bring all sorts of different experience, and there’s a good feeling in the camp. SM: There’s a really family feel to the garage today, I’ve spoken to Wendy (Lowdon, Graeme’s wife) and saw I think I saw John’s daughter earlier. GL: I think Manor’s always been like that, we race hard, but play hard and really enjoy it. 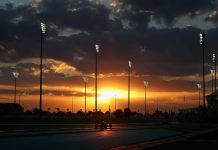 As you know, motor racing is incredibly hard work, and you don’t do it for the money, you do it for the competition, and for the passion as well. Finance is important, don’t get me wrong, it’s a business where you invest an awful lot, but not just in equipment, but in people. We know from building and rebuilding teams that growing talent is extremely important, so even from day one on this project, we’ve taken people on for whom this is their very first exposure to motor racing and they are doing it effectively as an apprenticeship, and we’ve always believed that is important. SM: I saw on your website the rather impressive statistic of 190 race wins since 1990? GL: 191, we think. To be fair, what it says is over 190, because we think it is 191, but you’re never completely sure, there may actually be a couple more that we’ve not thought of! SM: In entering the LMP2 category, you’ve opted for using ORECA 05 Chassis and Nissan engines, but I’ve read that you have aspirations of being able to work towards an entry in the LMP1 category in due course? GL: LMP1 has got attractions, but equally, the regulations are still being formed to some extent. Our view is that as a team, we try never to look at boundaries, instead, we look for opportunities, so going into Formula 1 was an opportunity, and one I’ll never regret at all, and LMP1 could equally be an opportunity, or back into Formula 1, who knows! In other words, our approach is not to rule anything out, and not to be frightened of a challenge, in fact quite the reverse. We will go and look to see how we can grow the business, and how we can compete in whatever arena we choose, whether it’s here, F1, or wherever. SM: At a high level, how different a challenge is it for you this year than your previous year in Formula 1, in team size, and how you go about the project? GL: The teams are much smaller, mainly because you don’t actually have to build the car – well, I should say you don’t have to design and manufacture it, you certainly have to assemble it! We sent a team of people to the ORECA factory for a few weeks, and as parts came off the production line and into stores, those guys built the car at the ORECA factory. Every part is homologated, you can’t buy success in this championship at all, and you can’t do that much with the aero side of it. The challenge here is how you race, and you have to try and be better at racing than the other guys. The advantage is that it’s not a competition of balance sheets, it’s a completion of ability, but also it’s one of experience which is something you can’t shortcut. Everyone in our garage is experienced, there’s people who’ve done multiple Le Mans, worked in Formula 1 at every level, as have John and I, but any formula has its complexities, and this is no different. You have to respect it, take it seriously and learn, and you can’t just say I used to race in F1 therefore I can understand any formula – there are some things in this formula that are incredibly complex. But fundamentally, the lights go out, the cars go off, 6 hours later, it finishes and if you’re ahead of the rest, you win! The simplest games are the best, and there is a simplicity about this which adds some beauty, but equally, there is a huge amount to learn, so it’s a massive challenge, building it from scratch. The teams we are racing against are very good teams, and very professional and experienced. We can’t just walk in and beat them. Friday during practice was the first day that we’ve run both cars on the same day, as the Prologue was with just one car, and the shakedown test at Rockingham with the other one. So based on that, we are pretty pleased with how it’s gone. During qualifying, we were there or thereabouts on time. We weren’t at the front but equally we weren’t at the back. We took some decisions on tyres that didn’t work for us, but we learnt from it, and that’s 20 minutes of learning that we didn’t have that we do now. The key objective for us is to be quick learners and I think we have demonstrated in the past that we are, and that will be the measure of how well we can do in this championship. SM: Last time we met – we talked about Fan Engagement. Since then we’ve had the Qualifying debacle in F1, and I’ve seen you vocalise how you felt about it and how bad it was for the spectating public. What are thoughts now it has reverted to 2015 style? Did you at any point feel glad not to be directly involved? GL: No, I never really looked at it like that, but I definitely don’t think it was the optimum way to go about things. I think it exposed some significant issues around the governance of the sport, and also people’s understanding of the governance. I saw Jean Todt had said that he thought that the drivers didn’t understand it, but I think it goes beyond that. If I thought it, then I expect a lot of other people thought it; I could not see what the point was of trying to solve a problem that didn’t exist. That’s why I was quite vocal about it before they ever ran, I could see no upside. Then, it took an awful long time for them to revert back, which equally didn’t reflect well. As I said before, the simplest games are the best; you have a car, you have a driver, you have a track and you have a stopwatch. I always think that the car must look good if a youngster wants to put it on their wall, and the format is good if you could play it on a Scalextric. You look at what they came up with and to me, if the objective was to have something that goes against the nature of qualifying and mix it up, you could do that in a far more entertaining way. Just get the drivers to dress up as clowns and pull balls from a hat, and sell tickets to raise money for charity! (Graeme laughs) The fans are not stupid, they are far from it, so if the objective was just to have a random order, then why dress it up? I personally don’t think it should be random, I think fans want to see that simplicity of how fast that particular car can go. We all know that Formula 1 cars go at different speeds because millions and millions are spent designing them, and something would be very wrong after that expenditure if they didn’t go that fast, but there’s a purity about qualifying where you see how fast they can get that car to go, and how can the team take advantage of weather opportunity or some clever thinking. But the musical chairs thing? If everyone does their job, then there’s no change in the order at all, but if someone makes a mistake, it’s highlighted massively because someone else benefits. It’s not about excelling, and if Formula 1 is the pinnacle of our sport it shouldn’t be about focusing on mistakes, but success. I couldn’t see a single thing in its favour at all, and I’m pleased they got shot of it! SM: I’ve been looking at your website, and I really like the fact that on your Contact page, it simply says “Don’t just follow us, come and join us”, a tagline with a great sentiment, and certainly appropriate as I’m seeing positive comments on social media, and people posting photos with you and the drivers today. Everyone is enthusiastic about this project, and you seem to be really engaging with the fans! Anyone can go and race anything, whether it’s a speedboat or a lawnmower. 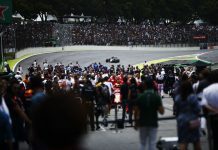 Safety aside, the prohibiting thing is usually money, and therefore the ceiling at which you have to stop racing things is set by the commercial world, and that is fuelled by the passion of fans; they are the ones who create the commercial model around Formula 1, for example. Without all those people watching, there is not a car company or a drinks company who would put a single penny in as the shareholders wouldn’t let them, so the fans truly are at the centre of everything, and I think they just deserve a little bit more than a ‘come and follow me!’. We are looking to do a few things, and we are starting to do a few things actually this weekend, which are down that lane. Also, on the contacts list, there are some very basic instructions here, similar to other teams, but we’ve added the contact for the track, to just come and say hello. To me, it’s such an obvious thing to say, and people do come and say hello to me as I walk in the paddock. SM: Even the email address is quite interesting, normally there will be Twitter, Facebook, Instagram, and a media contact, but not an email address just for fans? GL: It’s brilliant, because we get all sorts of emails from people who want to sponsor a team and don’t know how, to people who want a job, to people who want to tell you they support you, and good luck. Our view is that if you want to tell us something, here it is! So accept the invitation – engage with Graeme and the whole team at Manor on their journey of discovery in the World Endurance Championship – don’t just follow them, join them! High Five! It’s the 2013 Badger GP Winners Trophy Mug!